← Monday, Monday! This and That Post! Another brace of deep cold with fast frost bite warnings, another foot of snow coming in under 24 hours and all with strong blowing winds (of up to 80 km) an hour. It means I need to really watch for Cold Fatigue in a number of my livestock. 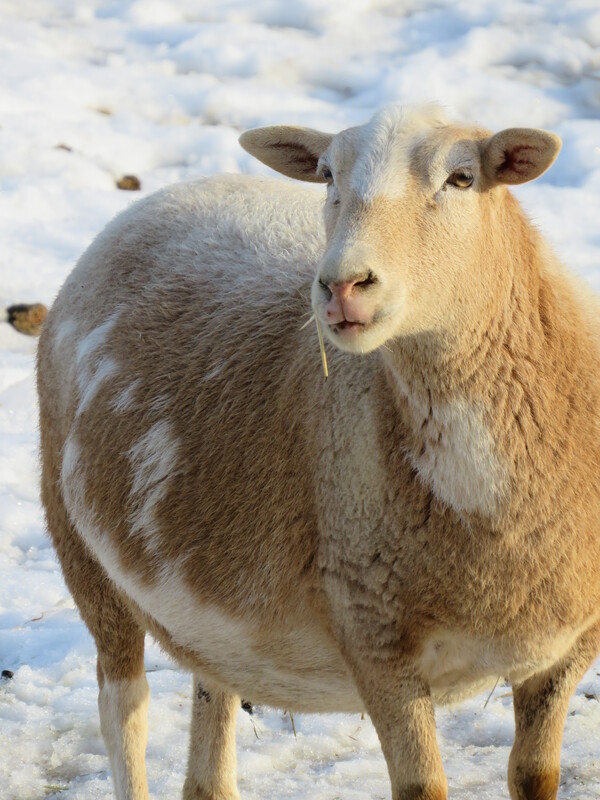 The biggest thing in regards to the sheep and goats is to keep a close eye on their body conditions, that means reaching in under their woolie coats and feeling directly on their ribs to make sure they have a good light covering of fat still, watching their rumps for weight loss. Also watch their tails as that can be another area that will show weight loss. Keep a good supply of loose salts out and available, not only are the salts good for them but it will get them drinking even more water. Keep a good supply of water available but make an effort to put out room temp warmish water twice a day to encourage even more drinking of water.. Often they will drink less in the cold. Keep a good quality hay in front of them 24 hours a day, you can feed it out in portions to make sure they are cleaning it up and not wasting, but that may mean two or even three feeds a day.. Hay is the heat engine for them. Consider adding in a grain or sheep/goat ration to add extra calories. They can only eat so much hay per day and if the weather is bad enough, and the cold keeps coming often enough.. they will slowly be dragged down from storm after storm.. Even as little as half a pound of grain per ewe or doe will go a “long” way to giving them that boost to come out the other side. Consider adding a vit/mineral booster in their drinking water over the worst of the storm days.. a day before, during and after. Lots and lots of warm bedding in a draft free area of the barn for them to rest in. Other than on the most bitter days, get them moving.. feed here, water here and have them walk between the area’s Movement is a healthy thing.. but at the worst of the weather.. you can consider locking them up the barn for a few days if needed. Watch your oldest, youngest and those most heavily expecting carefully.. they will be far more vulnerable, then the ram or open yearlings etc. Watch your water, make sure it does not freeze up if possible and bring out warm water at least twice a day. Lots of bedding on the floor. Close the door.. when it’s that bad of a storm, don’t let the birds have the final say.. time to close up the coop and take that choice away from them. Check under the wings and check for mites and treat if needed.. now is not the time of the year to allow an issue to develop in your coop. The birds have limited ability to dust bath in the cold, while the ducks will snow bath.. the chickens will not! Watch for frost bite on combs.. it’s not nearly as big of a deal as folks make out, it will nip off the tips on the roosters and they will die and fall off.. still if it’s a full comb that’s different and must be helped and treated. 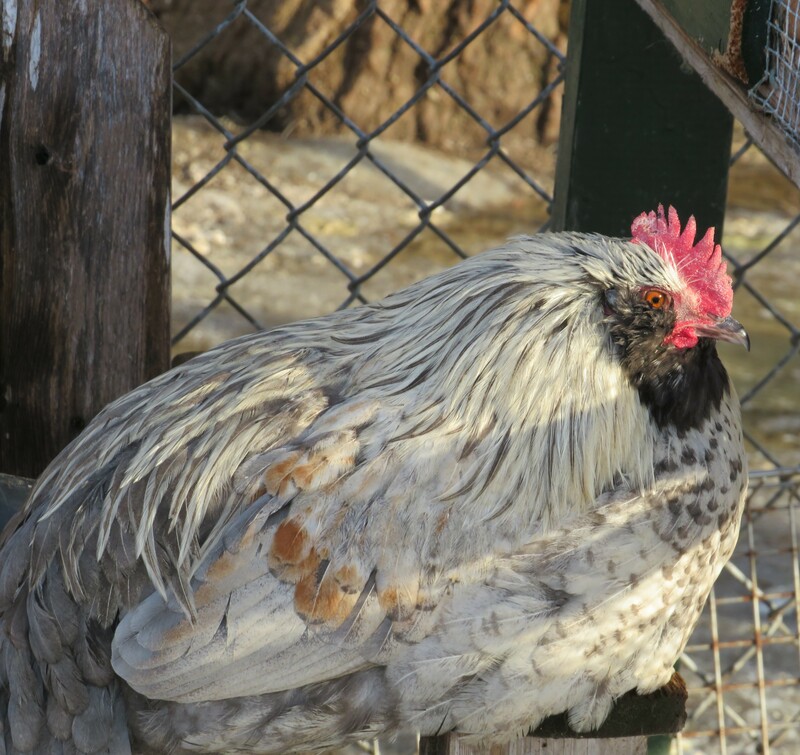 As long as you are not showing them, once treated, it will just mean that if you are keeping your handsome rooster, it will not have the same issue the next winter. If someone does get cold, here is a post on ways to help treat it. Watch their feet, ice on snow can cut feet, warm indoor bedding can hold their manure and push a bit into the cut and next thing you know, you have bumble foot.. Keeping an eye on them in the back forth between deep cold/melt/freeze as somethings they can also get ice balls if they have feathered feet.. most of the time this will just melt off on their own but I have had the rare time where it’s caused limping and its worth, giving them a bit of an extra hand by soaking the foot in just warm water to melt it out for them, just make sure its dried before they go back out. Increase their protein.. Some Meal worms, Some red wigglers, are you butchering anything, if so give them the meaty bones to clean up. In a pinch, a big old handful of dry cat food will also work and has been successfully used as a protein bump for many years. As my cat food has chicken in it, I prefer to use the worms and butcher scraps. Got some un-rendered pork or beef fat in your freezer, cut and hang a stripe for them to peck at.. If they are going to be locked up and are bored, put them to work, collect a fresh pile of horse, or cow poo and toss it in the pen, along with a bit of fresh hay in a different area of the coop.. this will provide lots of peeking and scratching to help break up the day. As for your farm cats, make sure they have dry straw in their sleep boxes, not blankets which can get wet from the snow, then freeze and lose their ability to help keep your purrpot warm in the big barns.. consider closing off the cat doors for a day or two and keeping them in. 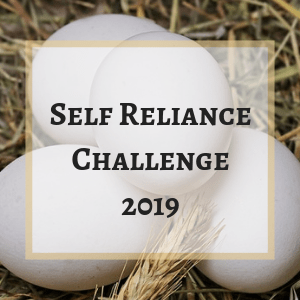 This entry was posted in farm and tagged Cold weather advice for fowl, Cold weather advice for sheep flocks, How to deal with extreme cold in livestock, Keeping your chickens safe in winter storms. Bookmark the permalink. We unfortunately had a bunch of lambs born in January (I didn’t expect any breeding to take place in the summer due to the intense heat we had (guess that was wrong!)) So, we have seen weak lambs and cold fatigue in our older ewes. It’s been a tough winter on all of us! Hi Tee, it has indeed been a hard winter on us, I am a touch surprised you had breeding with lambs in Jan as well.. Best of luck on keeping those older ewes intakes up and their milk production up to get those lambs up and going! I do find the lamb jackets do help for the weaker lambs in helping keep them warmer. Good luck. We got a small taste of the cold the rest of Canada is experiencing. That was enough for me. Stay warm and safe. I saw that, snow.. really good amount of snow even on the island.. my cousin lives in sooke and her place looks like a Christmas card. Thank you so much and you too! Great article to remind us how to help the livestock! Thanks for posting it on the Homestead Blob Hop. Thank you, Glad you liked it.. Great Job as always with the Blog Hop! Thanks for hosting!